he history of human evolution has been rewritten after scientists discovered that Europe was the birthplace of mankind, not Africa. “This study changes the ideas related to the knowledge about the time and the place of the first steps of the humankind,” said Professor Nikolai Spassov from the Bulgarian Academy of Sciences. “Graecopithecus is not an ape. He is a member of the tribe of hominins and the direct ancestor of homo. “The food of the Graecopithecus was related to the rather dry and hard savannah vegetation, unlike that of the recent great apes which are living in forests. Therefore, like humans, he has wide molars and thick enamel. The team analysed the two known specimens of Graecopithecus freybergi: a lower jaw from Greece and an upper premolar tooth from Bulgaria. Using computer tomography, they were able to visualise the internal structures of the fossils and show that the roots of premolars are widely fused. “While great apes typically have two or three separate and diverging roots, the roots of Graecopithecus converge and are partially fused – a feature that is characteristic of modern humans, early humans and several pre-humans,”, said lead researcher Professor Madelaine Böhme of the University of Tübingen. The lower jaw, has additional dental root features, suggesting that the species was a hominid. 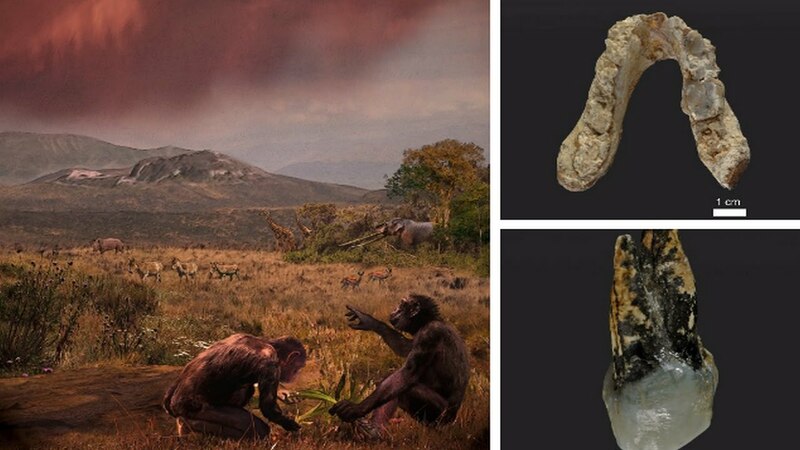 The species was also found to be several hundred thousand years older than the oldest African hominid, Sahelanthropus tchadensis which was found in Chad. “We were surprised by our results, as pre-humans were previously known only from sub-Saharan Africa,” said doctoral student Jochen Fuss, a Tübingen PhD student who conducted this part of the study. The team believe that evolution of hominids may have been driven by dramatic environmental changes which sparked the formation of the North African Sahara more than seven million years ago and pushed species further North. They found large amounts of Saharan sand in layers dating from the period, suggesting that it lay much further North than today. Professor Böhme added: “Our findings may eventually change our ideas about the origin of humanity. I personally don’t think that the descendants of Graecopithecus die out, they may have spread to Africa later. The split of chimps and humans was a single event. Our data support the view that this split was happening in the eastern Mediterranean – not in Africa. However some experts were more skeptical about the findings. Retired anthropologist and author Dr Peter Andrews, formerly at the Natural History Museum in London, said: “It is possible that the human lineage originated in Europe, but very substantial fossil evidence places the origin in Africa, including several partial skeletons and skulls. The new research was published in the journal PLOS One.